Many of our regular readers will remember the Rowdy Rooftop Burner Fund from back in May of this year organised by Bristol based Steal From Work. For our new readers or those that missed it, Rowdy's house/studio burnt down earlier in the year with the loss of literally everything he owned. The Rooftop burner Fund was set up to help the artist get back on his feet, with an auction of donated artworks. So... back on track and making killer, Rowdy returns with this vibrant three colour screen print. 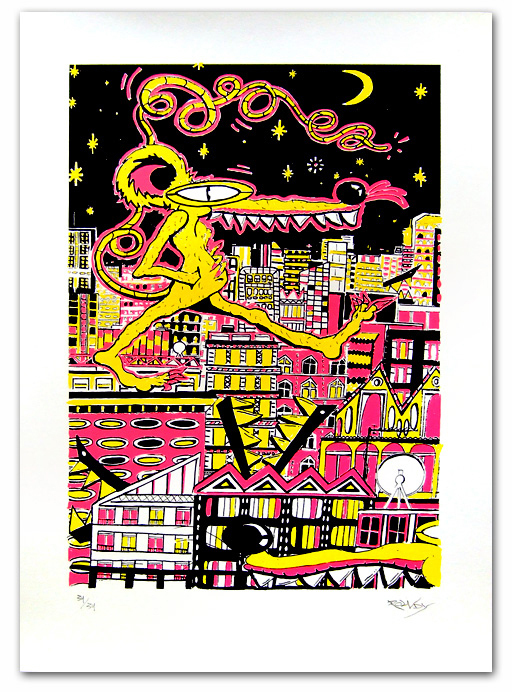 Printed by Bristol's infamous Screen One screen printers and edition to only 39, Neon Nitelife features a marauding gang of classic Rowdy characters stalking the city streets at night. The print will be on general release on our Steal from work site from 2pm Thursday 25 November.